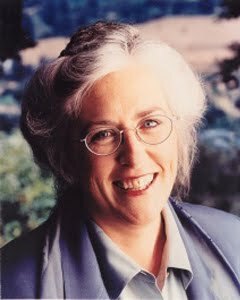 Book Passage contributing blogger Zack Ruskin recently spoke with Laurie R. King, the acclaimed Bay Area novelist whose Mary Russell and Kate Martinelli series are beloved by readers around the world. 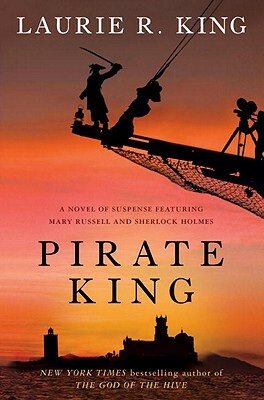 In her latest adventure featuring the intrepid Mary Russell and her husband, Sherlock Holmes, the New York Times bestselling author takes readers into the frenetic world of silent films — where the pirates are real and the shooting isn’t all done with cameras. Join us for a pirate-themed celebration as King celebrates the publication of her new book, Pirate King ($25.00), at Book Passage in San Francisco on Tuesday, September 6th at 6:00 pm. We are excited, because this is King's first event for her new book! Come in pirate costume & receive free pirate booty! This special event is co-sponsored by 826 Valencia: a percentage of sales will be donated to 826 Valencia. Zack Ruskin: I’m sure you get this a lot, but I’m curious about how much or little you expose yourself to other Sherlock Holmes media. Clearly you want to stay original with your portrayal of the character, but are you ever tempted to watch, say, the brilliant new BBC series that sets Sherlock in modern day London? Laurie R. King: Oh, absolutely! Benedict Cumberbatch and Martin Freeman are such a hoot, and I even love the Robert Downey interpretation. For some reason, films don’t seem to infringe on my own picture of Holmes in the way that books threaten to. I almost never read Holmes pastiches — I think I’m afraid that portions of those adventures might work their way into my subconscious and pop up in a later book, without my realizing that they’re neither mine nor Conan Doyle’s. Zack Ruskin: How long have you been waiting to release a pirate chapter in the Mary Russell saga? I can almost imagine you starting the whole series as a ploy to get to write a crazy awesome pirate book (because I totally would)! Zack Ruskin: Are you a big fan of early Hollywood films? Regardless, did you sit through a bunch of them to prep for Pirate King, or perhaps read an Errol Flynn tell-all biography? Laurie R. King: Watching old movies is one of those tough bits of research we academics (and ex-academics) commit to. Some of those early pirate films are mad fun, while others are remarkably gruesome—“The Black Pirate” begins with stripping bodies, gutting a man to get a swallowed ring, then blowing up a whole boatloads of sailors. Not at all the dynamic of Pirate King. The novel is much closer in flavor to Buster Keaton’s superb “Sherlock Jr.,” which I couldn’t resist referring to in the story. Great story and jaw-dropping special effects, what a genius Keaton was. Zack Ruskin: How do you concoct so many original, compelling mystery plots? Are you constantly plotting out ideas throughout your day, or is there some kind of methodology you employ? Laurie R. King: Oh, the plot is the hardest part by far. Especially because I don’t outline, so I have to plunge ahead and hope the thing makes some sense. Rewrites often leave me feeling as if I’m playing whack-a-mole with plot elements: I hammer one down, another pops up; I get that one sorted, a third one thumbs its nose at me. Some day I really must learn to outline. Zack Ruskin: I’m pretty sure you linking-up with 826 Valencia (aka The Pirate Store) to promote Pirate King is the best PR move ever. Have you been a fan of the pirate store for awhile? What do you feel is the most crucial piece of a pirate’s outfit? Laurie R. King: The 826 storefront in San Francisco does indeed make 826 Valencia the perfect link-up for Pirate King, just as Heifer International’s beekeeping project made that organization a great partner for The Language of Bees. But that’s such a difficult question: What does the essential pirate wear in order to swashbuckle with the proper panache and absolute confidence? Velvet coats with gold trim are only good in the winter; plumed hats tend to irritate the people in the seat behind; eyepatches and peg-legs make walking tricky; and even Captain de la Rocha (of Pirate King) would find it tough to get his cutlass through a TSA screening. Then there’s the high percentage of would-be pirates who are hormonally challenged when it comes to growing moustaches. So I’d have to say that the one absolute essential for a pirate outfit is in the attitude. Once a person gets in touch with his or her inner pirate, swashbuckling comes naturally. Zack Ruskin: One of the things I admire most about you is how connected you are with your fan base. I encourage readers of this interview to visit your website and see all the giveaways, contests, homemade art and more. How much do you allow your readers to influence the choices you make with your books and characters? Laurie R. King: It’s an interesting shift in the world of a writer, isn’t it? When I first started, in the 90s, I met my readers once a year when I went on tour, and if they wanted to write, they had to put a stamp on an envelope. (I still get some of those — and I still answer them all.) Now, I’m on Facebook every day, give out my email address, post regularly on my blog, put my book list on Goodreads, and via Mary Russell, Tweet. But how much do readers influence the actual books? Not at all. Hey, I barely have any control over what the characters do. My editor and I make an initial stab at what the next book is going to be about, and then we both sit back and wait to see what happens. The one thing I do open to fans is naming a character. The last few books, I’ve made the prize for the fund-raiser (this year, 826 Valencia) a chance to name a character in the next book. Fans (or their pets, their mothers, or their grandkids) can become a corpse or a suspect or the person who brings Mary Russell a cup of tea, just by donating to my chosen project. Zack Ruskin: In addition to Pirate King, 2011 has also seen you publish the e-novella Beekeeping for Beginners. What prompted you to write about the initial encounter between Russell and Holmes from the latter’s point of view? Laurie R. King: Beekeeping for Beginners started when my editor asked me to do an exclusive e-story, perhaps one that developed a minor character from one of the books. And I thought about how in recent books, although they’re still very much Russell’s first-person memoirs, they’ve started to include portions of other characters’ points of view. So I decided to apply that same shift to the very first scene from The Beekeeper’s Apprentice, to see what actually was going on when Russell first met Holmes in 1915. Zack Ruskin: I almost hate to ask, but do have an end-game in mind for the Mary Russell series? Are you content to keep offering new installments as long as you can write them and people want to read them? Laurie R. King: No end game. Which should come as no surprise, since I barely have an end in mind with each individual story. I do have a sense of the series arc, but it’s very flexible, and so far I can see no need to even consider an ending. Yes, Holmes is getting older, but since each book seems to take up about six weeks of their lives, he’s not ageing very fast. And I’m not getting bored. Zack Ruskin: Any pirate literature (fiction and non-fiction) you encountered while writing Pirate King that voracious readers should look for once they’ve finished your book? Laurie R. King: Apart from Treasure Island, that is? I loved Daniel Defoe’s A General History of The Pyrates (edited by Manuel Schonhorn) which has some superb stories of piracy. The chapters on Mary Read and Anne Bonny alone make it worth the price of admission. Zack Ruskin: Do you ever use what you’re writing about as a pretense to do something really fun? For example: did you find it necessary, for research purposes, to go out on a pirate ship and sail around? Laurie R. King: Of course! I do all the hard research, such as going down to the Point Dana Tall Ships festival and booking a sunset cruise on one of the brigantines, to sail up and down as the sun is setting, and fire cannon and water balloons at each other. And Pirate King is set in two places I traveled last year, Portugal and Morocco. Can hardly wait for the 12th book in the Mary Russell series! Is there one in the works, I wonder.